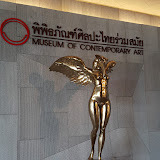 The Museum of Contemporary Art (MOCA) in Bangkok opened in March of 2012 and houses the works of art collected over 3 decades by Mr. Boonchai Bencharongkul. The architecture of the MOCA building is quite amazing in itself, appearing to be carved from a single piece of granite – 5 stories high. MOCA’s paramount mission statement is “To preserve and protect Thai art and culture so they remain forever in the nation as an archetype that reflects the foundation of Thai culture”, therefore, the majority of the works of art on display have been created by Thai Artists. Each of the 5 Floor, focus either on specific artists or types of art, with the 5th displaying works of art from other countries. MOCA is located outside the main part of Bangkok and is about a 30 minute taxi drive north from the Mochit BTS Station.